This year, passengers can once again enjoy the sight of nighttime cherry blossoms from the window of their train carriage. 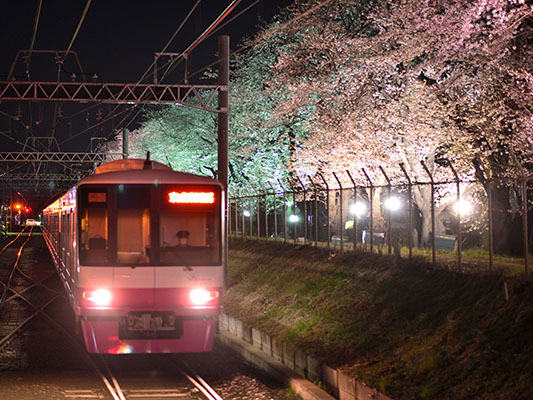 The Shin-Keisei Electric Railway Company will, for the sixth consecutive year, illuminate the row of cherry trees growing alongside the tracks, from March 30 (Thu) to April 5 (Wed), 2017. 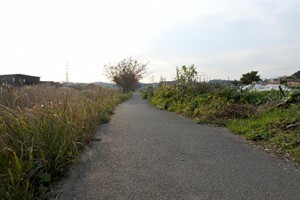 This row of cherry trees was planted beside the railway line crossing the Japan Ground Self-Defense Force’s (JGSDF) Camp Matsudo (between Kunugiyama Station & Motoyama Station). The view has been enjoyed by many customers over the years. Since 2012, we have worked with the JGSDF’s Camp Matsudo to illuminate the cherry trees as dusk falls. Additionally, since 2015 the JGSDF camp has been specially opened to the public at specific dates and times during the illumination period, allowing visitors to enjoy the nighttime blooms from even closer. We hope that our customers, such as families returning home from a trip, or busy commuters who lack the time for cherry blossom viewing, will enjoy the sight of the illuminated blooms from the windows of their carriages. We also recommend visiting the JGSDF site that is not usually open to the public. Visitors can see the pink trains of the Shin-Keisei line running alongside the beautiful cherry blossoms. By all means, please take this opportunity to visit the JGSDF facility. 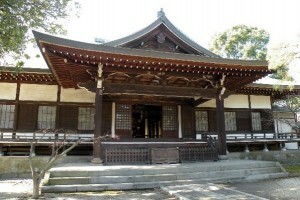 * Entrance to the JGSDF site is via the South Gate, a 5-minutes walk from Kunugiyama Station. A row of approx. 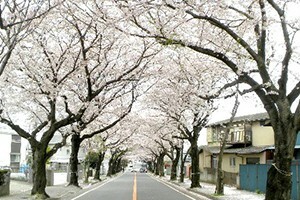 30 cherry trees, covering a distance of 250 m along.